The Jason Continuity of Service (Jason-CS) mission on the Sentinel-6 spacecraft will carry the next generation of high-precision altimeters. This collaborative mission between the U.S. and Europe will consist of two identical satellites (A and B), extending key ocean data records beyond three decades. Jason-CS/Sentinel-6 will also collect high-resolution vertical profiles of atmospheric temperature to support weather prediction. Jason-3 is the fourth mission in U.S.-European series of satellite missions that measure the height of the ocean surface. The mission will extend the time series of ocean surface topography measurements (the hills and valleys of the ocean surface) begun by the TOPEX/Poseidon satellite mission in 1992. These measurements provide scientists with critical information about circulation patterns in the ocean and about both global and regional changes in sea level and the climate implications of a warming world. OSTM/Jason-2 - The Ocean Surface Topography Mission on the Jason-2 satellite, is a follow-on to Jason-1. It takes oceanographic studies of sea surface height into an operational mode for continued climate forecasting research and science and industrial applications. Launched: December 7, 2001, Decommissioned: July 2013. Jason-1 continued the task of providing the important oceanographic data time-series originated by TOPEX/Poseidon, carrying updated versions of the same instruments. It flew in tandem with TOPEX/Poseidon for 5 years. (See the Tandem Mission Flash animation for more details). Launched: August 10, 1992, Decommissioned: January 2006. GRACE - Gravity Recovery and Climate Experiment, is flying two identical spacecraft about 220 kilometers apart in a 500-kilometer elevation polar orbit producing monthly maps of the geoid. The geoid is a hypothetical surface of the Earth that is coincident with mean sea level. It is perpendicular, at every point, to Earth’s gravity. It is the basic surface on which all altimetry data is based. The agreement in 1987 between CNES and NASA to join resources and expertise on the TOPEX/Poseidon project culminated 20 years of development into using a spaceborne radar altimeter to measure ocean-surface topography. TOPEX/Poseidon was launched August 10, 1992 from the ESA launch facility at Kourou, French Guiana, aboard an Ariane 42P launch vehicle. TOPEX/Poseidon data revolutionized the way the global ocean is studied. For the first time, the seasonal cycle and other temporal variabilities of the ocean were determined globally with high accuracy, yielding fundamentally important information for testing ocean circulation models. Many major observations were made using TOPEX/Poseidon data. Recognizing the importance of continuing ocean surface topography measurement, NASA and CNES approved Jason-1 as a joint follow-on to TOPEX/Poseidon. Many years of scientific discovery by TOPEX/Poseidon have broadened its original list of science objectives. Jason-1 flew as a joint NASA/CNES follow-on to TOPEX/Poseidon. OSTM/Jason-2 is a joint NASA/CNES/NOAA/Eumetsat mission, launched as a follow-on to Jason-1. Each of the spacecraft carry 5 similar or identical instruments. 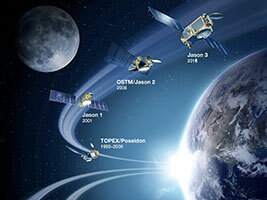 On OSTM/Jason-2, the CNES-supplied spacecraft carries the payload of five instruments: the POSEIDON-3 dual frequency altimeter, the mission's main instrument which measures altitude; the Advanced Microwave Radiometer (AMR) to measure perturbations due to atmospheric water vapor; and the three location-finding systems: the DORIS Doppler orbitography beacon, the laser retroreflector array (LRA), and the Global Positioning System Payload (GPSP). These instruments are designed to provide measurements for at least 5 years. 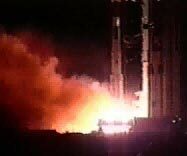 Jason-1 and OSTM/Jason-2 were launched from Vandenberg AFB aboard NASA-supplied Delta rockets, Jason-1 on December 7, 2001, and OSTM/Jason-2 on June 20, 2008. After TOPEX/Poseidon was decommissioned in January 2006, for the next 11-1/2 years, Jason-1 continued the task of providing the important oceanographic data time-series originated by its predecessor. 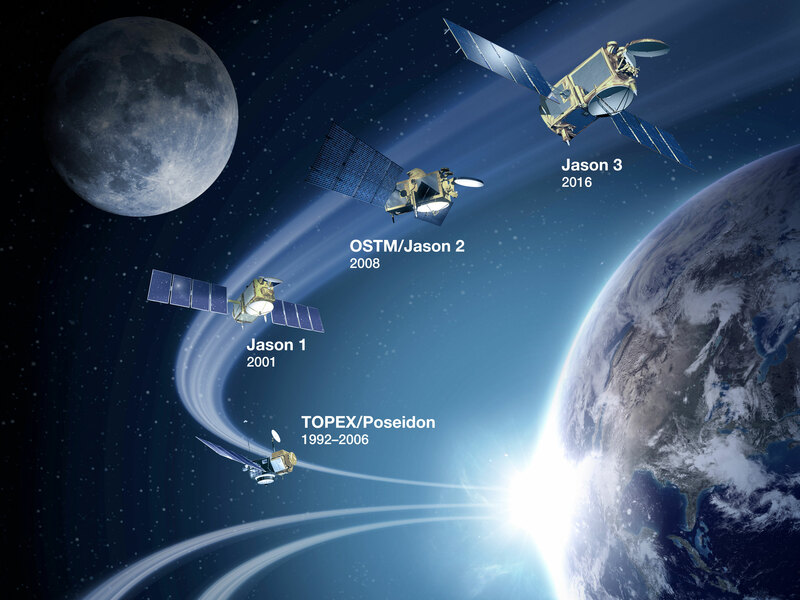 Jason-1 was decommissioned in July 2013, and now OSTM/Jason-2 continues this important data into the third decade. OSTM/Jason-2 is integrated into numerous international climate-study programs, provides near real-time data access, and marks the beginning of the operational era of collecting these critical oceanographic parameters. The fourth mission in the altimeter series, Jason-3, launched January 17, 2016. Have you ever looked up in the night sky to see a satellite? Have you wondered what satellite it was? Maybe it was OSTM/Jason-2 or Jason-3. You can find out! See where OSTM/Jason-2 or Jason-3 is right now. To find out when you can view this satellite from your area, go to Heavens-Above and follow the directions below. Under Configuration, and “Current observing site”, select your location from their map or database. If you want to enter your coordinates manually, follow the instructions on the link, “edit manually”. Read the instructions and enter your town or village. If a list of towns are returned, select the correct one. Under Satellites, choose "Select a satellite from the database." In the Satellite Name: jason 2 (no dash) for OSTM/Jason-2 or jason 3 for Jason-3. From the Satellite Search Results list, select the satellite. In the upper right of the page, select Passes to see when you can view the satellite from your location.